There were high hopes for a "space for everyone" era in 1952, and certainly no shortage of people interested in exploring the planets, no matter the danger. The following excerpt includes adventure seekers with amusing motives such as "fur-trapping rights on the planets" -- among others. Happy Flashback Friday! EVEN the most enthusiastic prophets of space travel admit that there are still some problems to be solved before the first rocket takes off for the Moon. But there's one thing that won't be any problem: getting passengers. 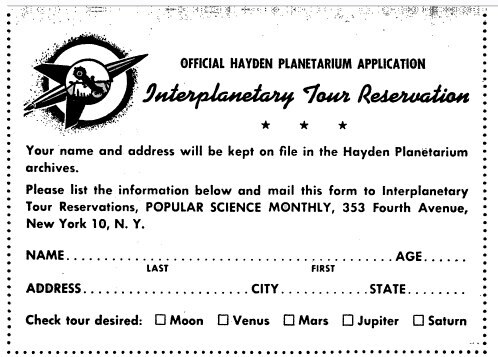 Right now the Hayden Planetarium, in New York City, has a file of more than 24,000 people who have signed up for seats on the inaugural interplanetary tour. Although the Planetarium is still taking reservations, it makes no promises. It is not building a rocket ship for space flight. Planetarium chairman Robert R. Coles says that the oldest applicant, an 85-year-old West Virginia woman, who wrote, "Hurry up with that space ship as I'm getting on in years," probably will not make it. But thinks the chances are good that a 6 1/2-year-old applicant will live to make the flight. 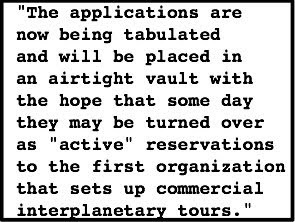 The applications are now being tabulated and will be placed in an airtight vault with the hope that some day they may be turned over as "active" reservations to the first organization that sets up commercial interplanetary tours. And that day may not be too far distant, according to General Joseph T. McNarney, U.S. Air Force, retired, now president of Consolidated Vultee Aircraft Corp. "Actually," he said recently, "some of the problems we are working on right now in the field of guided missiles... are basically more difficult than the problem of building a space ship. If we can accomplish the former, and I assure you we will, then there is absolutely no reason why we can't also do the latter." And to be even more realistic about the matter, an Air Force School of Space Medicine has been set up and is studying the effects of prolonged "weightlessness" that would be experienced by human beings in interplanetary flight. Applications for space-flight reservations have come to the Planetarium from almost ever country in the world - including, understandably, places behind the Iron Curtain. They represent all age groups. Teenagers are probably in the majority, with a good splattering of small fry. But adults are there by the thousands -- men and women -- from all walks of life: professional men, business men, GIs, adventurers, and opportunists. There is the New York fur broker who wants to go along to establish fur-trapping rights on the planets. An insurance broker, destination Moon, already has named the firm he would like to establish, the Interplanetary Travelers Insurance Co., with address Moonbeam Drive. He plans to pay claims in interplanetary currency. A salesman of building materials wants to go to the planet within easiest commuting distance of the other planets. "There'll be a lot of new homes going up and I'll have to get around." Romance prompted the application of a sergeant who wants to spend his honeymoon on the Moon. He asked that his name and that of his girl friend be kept secret as he had not yet popped the question. One potential space pioneer explained his urge simply, "I have served in the Air Force and just love space." And another, "You may think I am a little crazy, but send me two tickets to the Moon." The older, more conservative applicants are satisfied with going to the Moon. The brasher younger element go for the planets -- with Mars top choice. One eager beaver wrote in canceling a previous application for Mars and changing his destination to the Moon. "Lunar flights might materialize sooner because it is closer," was the reason. Neighbor Moon (240,000 miles away) has been eyed by space-flight enthusiasts for many years. Because it is so close, we know more about the Moon than the more distant planets. Even with the naked eye we can make out solid physical features on the Lunar surface. With a little imagination and a low-power telescope these become rugged but romantic mountains and valleys. Because the Moon is closest to spaceflight reality, the Hayden Planetarium has prepared an advance briefing for passengers on the first Lunar rocket voyage: Only one pound of luggage will be allowed per passenger, since the rocket ship will burn 66 pounds of fuel for every pound of its structural weight. For take-off, passengers will be strapped to special supports to minimize the shock of acceleration. Passengers with high blood pressure may experience a momentary blackout. Upon arrival at the Moon, say the Planetarium's experts, passengers will be instructed to don oxygen helmets and anti-ultraviolet-ray suits. They will have to learn to walk all over again since each person will weigh only one-sixth as much as he does on Earth. And walking will be made even more difficult because the Lunar surface is covered with two to three feet of pumice-like dust. The stay on the Moon will be one Lunar day (two weeks' Earth time). Arrival will be at dawn and departure at sunset, since temperatures will drop to minus 459 degrees when the sun sets. Midday might be too hot without refrigerated suits -- the temperatures soars above the boiling point. But stepping into any shadow will be a quick way of cooling off. In the belief that we should make a good impression on any planetary residents, an Australian actress, who made her reservation more than a year ago, recently wrote from Paris that "I am seeking a famous French Couturier to design a special space wardrobe for my forthcoming interplanetary tour." A look-before-you-leap applicant is the man who wants the answers to some questions before he signs up for interplanetary flight: "How much is it going to cost? What is the proposed means of propulsion -- magnetic energy or jets?" The Planetarium can't, of course, answer the cost question, except that at current airline rates a one-way trip to the Moon would cost around $15,000 and to Saturn about $48,000,000. Some applicants are choosy, like the man who wants a planet flight, but insists on a reservation to Mars because he understands "It is not as cold there as on Jupiter". The prize ulterior-motive applicant is a third-year high-school student. "On a trip to the Moon or one of the planets I could learn more than in my school career combined with everyday life. Should I pack a box lunch?" One candidate for flight to Saturn (790,000,000 miles) regretted that he couldn't come to New York City to make his reservation in person. He lives too far away -- 200 miles upstate. The attitude of the majority of applicants is summed up by the following note appended to a reservation blank: "This chance to put our names on file for future spaceflight gives me the feeling that interplanetary travel is just over the horizon." By L.G. Tooker, Popular Science, 1952.